The ancient Celtic Cross, which stands near the Chapter House doorway, testifies to the tradition of 1400 years of Christian worship. The earliest parts of the present Cathedral however, date from the twelfth century when Bishop Urban built the first stone church, that being a Norman replacement for St Teilo's Little Minster. The new Cathedral was later extended and prospered but in the 16th century, following the Reformation, its fortunes declined. Repeated storm damage, desecration, lost revenue and prolonged neglect led to almost total ruin, before restoration during the 18th and 19th centuries. Extensive and severe war damage in 1941 necessitated major rebuilding and restoration. Under the architect George Pace, this challenging task was begun and it included the installation of Jacob Epstein's Christ in Majesty surmounted on a parabolic arch, the construction of the St David Chapel and of the Processional Way. The Cathedral's eventful history can be read in its stones and different styles of architecture. Within its walls stand the tombs of St Dyfrig and St Teilo - two of the Cathedral's Celtic Patron Saints. In addition to Epstein's compelling Majestas, the Cathedral contains work by medieval, pre-Raphaelite, Victorian and contemporary artists and craftsmen. These works include Rossetti's acclaimed painting The Seed of David, John Piper's depiction of The Supper at Emmaus, the porcelain panels designed by Burne-Jones, the inspired bronze sculptures by Frank Roper and the Lady Chapel windows by Geoffrey Webb. We have replaced the old organ with a completely new Nicholson Organ details of which are on the website. It is the first completely new organ to be built in Britain since the Coventry organ was built after the 2nd World War. 7.30 Morning Prayer; 8.00 Holy Eucharist; 9.00 Parish Eucharist; 11.00 Choral Eucharist; 12.15 Holy Eucharist; 3.30 Choral Evensong; 6.30 Compline. Morning and Evening Prayer is said or sung and the Eucharist is celebrated daily. For times of these services and additional Celebrations on Feast Days, please see Cathedral notice board, website or ring the Cathedral Office. The Cathedral is open daily from apporximately 9.00am to 7.00pm. Please telephone ahead for group visits. Cathedral visits, with or without a guide are free, but we do suggest that visitors make a donation of £3.00 per person. By bus: numbers 25, 33 or 62, alight at The Black Lion and walk up High Street. By car: M4 travelling west, leave on J29 to A48(M), then A48 and follow brown signs. M4 travelling east, leave on J32 to A470 Cardiff direction, leave A48 and follow brown signs. 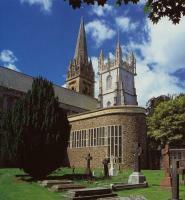 From Cardiff City centre, take Cathedral Road to A4119 (Llantrisant) at Llandaff and follow brown signs.